Your New Jersey attic can be the perfect environment for serious mold development if you are not careful. Conditions like excessive heat, high humidity, or roof leaks can be an adequate water source for excessive attic mold growth. Attics in South Jersey homes often suffer from poor ventilation and/or poor insulation that can restrict air circulation and allow moisture buildup over time. 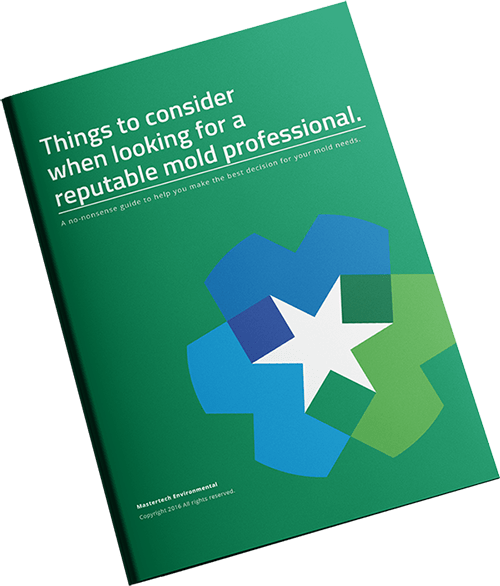 If you detect signs of a possible attic mold problem in your New Jersey property, contact a certified mold remediation professional in your South Jersey area who will have the necessary tools, training and experience to safely and effectively address the mold. Mastertech’s attic mold remediation professionals in NJ can identify if your attic has a mold problem and develop a safe and effective attic mold remediation plan. Following a proper attic mold remediation, it is important for NJ homeowners to implement attic mold preventatives to prevent possible recurrence. Why do I Have Mold in My New Jersey Attic? Aside from the obvious roof leak, some moisture problems are not as easy to spot. One reason being that we often do not spend enough time in the attic to notice a problem in its early stages. Another reason being that some moisture problems are seemingly minor and easy to overlook. But, it is important to keep in mind that if you neglect event he most minor of moisture, it can worsen or buildup over time and leave you with serious property damage and widespread attic mold growth. A thorough attic mold inspection in NJ, completed by a trained and certified mold inspector, will determine if you have mold, how bad it is, what caused it, and how to properly fix the problem. Visual Assessment- Your MasterTech inspector will complete a comprehensive visual analysis of your NJ attic to identify any conditions that could be causing and sustaining mold growth. Moisture Mapping- Your attic mold inspector will carefully map out the damp or wet areas throughout your attic to determine moisture migration patterns and get to the bottom of where the water starts and stops. Moisture Meters: Moisture meters allow your inspector to read the moisture content of building materials in your attic. Moisture locked within porous building materials like attic sheathing can go unnoticed for a long time. Thermal Imaging: Your attic mold inspector will use the temperature difference between wet and dry materials as a guide to help determine what areas of the attic are damp, even if dry to the touch. This will allow for a more thorough understanding of the mold growth pattern. Attic Mold Testing– Surface and/or air quality samples will be collected and analyzed by an accredited laboratory. The lab report will provide scientific data that will determine is there is elevated mold present, the species of mold present, and how to effectively resolve the attic mold issue. Report of Findings– Your Mastertech inspector will develop a detailed, easy-to-read report that outlines what the inspector did, what he/she found, and what to do next. If deemed necessary, your inspector will present you with a recommended scope of work for attic mold remediation. 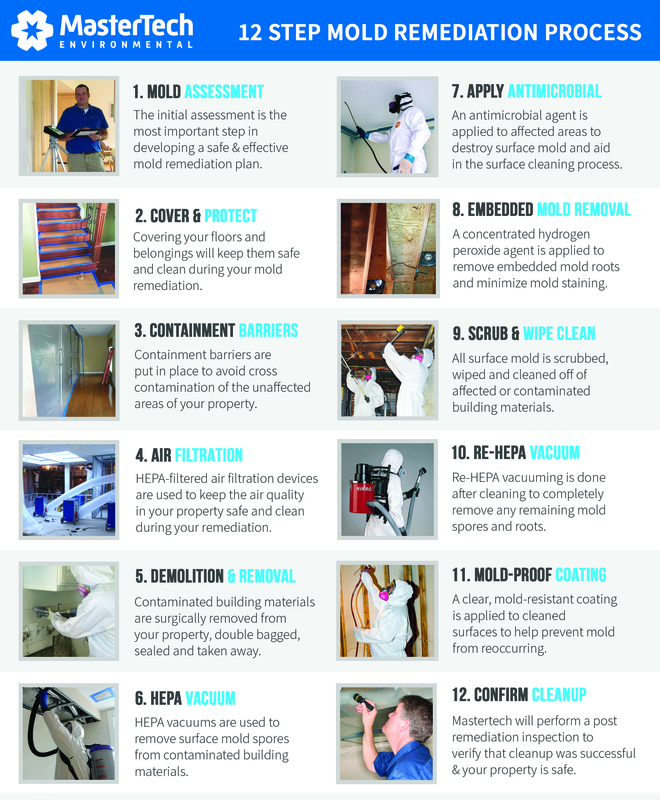 Mold is a bio-contaminate that may require immediate professional remediation. It is important that attic mold remediation is completed following strict cleanup procedures and adhering to specific health and safety regulations. As part of Mastertech’s commitment to doing the job right, we provide our clients a 5-year,mold-free warrant with every mold remediation in Southern New Jersey. The NJ attic mold remediation professionals at MasterTech Environmental are thoroughly trained and equipped with the necessary knowledge, skills, and tools to safely address your attic mold remediation needs. Your Mastertech mold inspector will develop the safest and most efficient scope of work that is tailored to your specific mold remediation needs. Our carefully developed attic mold remediation process is key to the success of our mold remediation work. We will never compromise our process for any reason because that is how we ensure that your attic mold is safely and properly addressed. At Mastertech Environmental, each attic mold remediation technician on our specially trained team must undergo intensive technical and safety training to ensure that they are ready for the job. With our focus on quality control and safety, you can be sure that we will provide you with the safest, most effective and most efficient remediation services possible. We strive to exceed client and industry standards by going the extra mile to get the job done right. Call 609-948-8844 today to ask about our professional attic mold remediation services in your New Jersey area. We will be happy to answer all your questions and schedule you for an appointment with one of our certified professional mold inspectors. In addition to attic mold remediation, Mastertech Environmental also provides the following professional mold services: basement mold remediation NJ and crawl space mold remediation NJ.